Mikula Contracting, Inc. has many years of experience with troubleshooting commercial drainage issues. Those issues might involve street water, storm water damage, or trench drainage systems. If you have problems due to any of those, let us solve your water problem with complete drainage design. 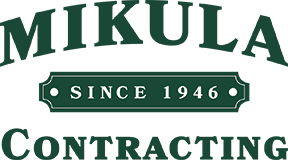 Mikula Contracting has over 70 Years of Service and Experience in the excavation industry. Consequently, you will be completely satisfied that you contacted Mikula Contracting, Inc.
Mikula Contracting, Inc. also provides Ground and Land Drainage, Surface Drainage Systems, Rain Water Drainage, Seepage Pit Installation, and also Standing Water Drainage. Whatever your water and drainage needs are we are here to help educate you through the entire drainage solution process. We provide commercial drainage services in Essex, Hudson, Bergen, Passaic, Morris and also Union Counties. Get a Fast Quote for your residential drainage services in Northern NJ throughout Essex, Hudson, Bergen, Passaic, Morris and Union Counties.